Boeing delivered the first 737 MAX 8 to Comair Limited, which becomes the first airline in sub-Sahara Africa to operate the fuel-efficient jet. The airplane is the first of eight 737 MAX airplanes on order for Comair as the airline looks to refresh its fleet and offer better service for its passengers. The new airplane enters a growing African aviation market, where the domiciled fleet has almost doubled in the past two decades. And over the next two decades, Africa will require nearly 1,200 new jets, according to Boeing’s Commercial Market Outlook. Boeing airplanes represent nearly 70 percent of the continent’s in-service fleet. Comair flies an all-Boeing fleet that includes 18 Next-Generation and seven Classic 737s for its kulula.com and British Airways (operated by Comair) brands. The 737 MAX 8 will allow Comair to achieve 14 percent better fuel efficiency and lower emissions, while flying 600 nautical miles farther than its predecessor. The MAX’s improved performance is enabled by advanced CFM International LEAP-1B engines, Advanced Technology winglets, and other airframe enhancements. Outfitted with the popular Boeing Sky Interior, the MAX 8 can seat 189 passengers in a single-class configuration. The 737 MAX family is the fastest-selling airplane in Boeing history, accumulating over 5,000 orders from more than 100 customers worldwide. Comair operates in South Africa as a British Airways franchise carrier. Top Copyright Photo (all others by Boeing): British Airways-Comair (South Africa) Boeing 737-8 MAX 8 ZS-ZCA (msn 60432) BFI (Joe G. Walker). Image: 945738. 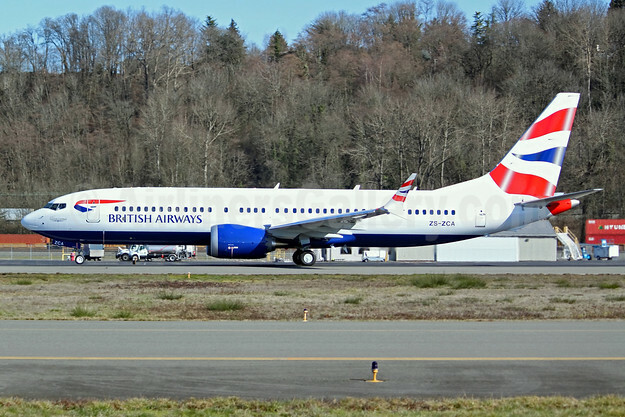 This entry was posted in British Airways, Comair (South Africa) and tagged Boeing 737-8 MAX 8, British Airways-Comair (South Africa), msn 60432, ZS-ZCA on February 27, 2019 by Bruce Drum.